Broadcast Engineering Consultants India Limited (BECIL) invited applications for recruitment to 15 Developer & Designer posts. The candidates eligible for the post can apply through prescribed format on or before 17 October 2016. BECIL Job Notification: Broadcast Engineering Consultants India Limited (BECIL) invited applications for recruitment to 15 Developer & Designer posts. The candidates eligible for the post can apply through prescribed format on or before 17 October 2016. 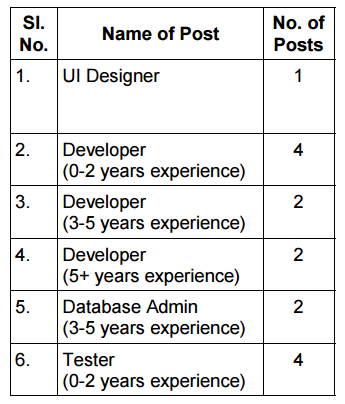 Eligibility for UI Designer Post: BE/B.Tech/ MCA/ BCA/ BFA/ MFA/ B.Arch/ B.Design/ M.Design/ PG Diploma in Web Design. Candidates are required to send duly filled in application form along with self-attested photocopies of educational/ experience certificates, two passport size photograph and registration fee of Rs.300 by cash or demand draft drawn in favor of Broadcast Engineering Consultants India Limited payable at New Delhi may be submitted to Assistant General Manager (HR) in BECIL’s Corporate Office at C-56/A-17, Sector-62, Noida-201307 (U.P). SC/ST/PH candidates are exempted from registration fee.